hen I’m about to talk about specific parts of the book. This book picks up a week or two after escaping from Camp Haven. Cassie and her friends are living in a old bunged up hotel, which they call the “Walker Hotel”, in honour of Evan. Cassie still hasn’t found Evan and everyone else thinks that he is dead. Surviving the major destruction of earth was almost impossible, but now, it’s harder. Cassie finds herself in a world where almost no one can be trusted, not even a child. This book was pretty awesome in general, but if I’m going to be specific, I’m going to have to dig into the highlights! A major highlight was Ringer. I loved that we got to explore Ringer throughout this book, more so than in The 5th Wave. Cassie still seemed to be the protagonist but Ringer had a larger part in the book which was really interesting because we got to learn more more about her past and what she’s really like. Another highlight (SPOILER ALERT! SKIP TO NEXT PARAGRAPH) was that Evan lives! I’m glad that he was kept in the series. Lastly, another highlight was one of the new characters — Razor! (SPOILER ALERT! SKIP TO NEXT PARAGRAPH). Razor was a great addition to the book because he is a very confusing character, to me, anyways. It’s really easy to feel an abundance of different feelings towards him. At first, I didn’t think anything of him at all. But after he appeared numerous times, this changed. I thought he was kind and caring, but then I didn’t. Then I liked him again and then I didn’t. Then I wasn’t sure! Now, I think he’s alright. I am feeling a bit iffy about him though. 😋 Feel free to comment with your thoughts on Razor! The character development in this book was fantastic, especially for Ringer. I loved that we really get to learn about her past and who she really is throughout this book. I liked that she talked about her father and what he was like. I liked learning her real name -- Marika. Digging into who she was was definitely something I enjoyed about this book. I love how she always is taking risks and thinking on her feet. We also got to learn about Vosch, which was also interesting, but I really really really strongly dislike him. I really hated how he mimicked Ringer's father to purposely disturb her. Vosch has such an egregious personality!! I also liked that we got to learn more about Evan's past as well, and that we got to see what had happened between him and Grace. Okay, now it's getting harder. What do I wish I saw more of in this book? When I ask myself this question, I have two answers that pop into my head. 1) I wish I saw more of Cassie throughout this book! I felt as though this book was really focused on learning about Ringer more than any other character, which was great, but I would've relished seeing more of Cassie. 2) I thought that Rick Yancey did a good job concluding the book, but I wish it didn't leave me off as much as it did. It was greatly concluded but I was hoping for a bit more. I need to give a huge round of applause to Poundcake. He is such a hero!! I think it's really unfortunate that Cassie and Ben don't know how he sacrificed himself so that he could save them. He committed such a heroic act. He sacrificed his life so that he could kill Grace so that Cassie and the others could get away. He saved everyone. Until then, I hadn't pictured Poundcake as a brave character. His story broke my heart into thousands of pieces. It was so sad. And then he dies. This made me so sad!! I really admire his bravery. Somehow, I'm worried that Grace didn't die because of her great "superpowers" and that she'll come back. Let's hope not! Anyhow, I'm really looking forward to reading The Last Star! I'm hoping that we'll see more of Cassie and that the book will conclude the series phenomenally. I know it sounds awful, but I hope that Vosch will d-i-e. I cannot stand him whatsoever and he is a character that truly annoys me. I hope that we'll see more of Cassie and Evan, and maybe even Ringer and Razor. I'm also hoping that Razor will be reunited with Cassie, Ben, Sam, etc. 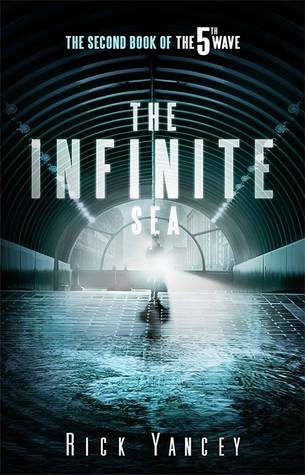 I'm giving The Infinite Sea 4 stars. Why? The book was very enjoyable and the writing style was superb! I love how I am still super hooked onto and excited for the final book of the series. I really enjoyed this book, but it wasn't as exciting as The 5th Wave.